Why Choose Sure-Lock As Your Naples Locksmith? For about as long as locking mechanisms have existed, locksmiths have managed to get countless people out of sticky situations. No one expects a hero to be dressed in an embroidered black polo shirt, wielding pick guns, key extractors, and tension tools. But in that moment of peril when you realize that you’ve accidentally locked your keys inside of your car, or you somehow lost your house key on the journey home, there’s no feeling of relief quite like that brought on by the presence of a skilled locksmith. These lock and key experts can also help secure your life in a myriad of other ways. Unfortunate but true, business owners here in Collier County, FL are subjected to burglaries, theft, and vandalism, generally resulting in stolen inventory and countless dollars lost. Businesses, not unlike people’s homes, need high-quality, tried-and-true security solutions to ensure that everything stays safe and…well, secure. Fortunately, for those living in and around Collier County including Naples, Fort Myers, Bonita Springs, Marco Island, and Ave Maria, Sure-Lock Locksmith is here to help. Eddie and the team at Sure-Lock have seen it all when it comes to locksmithing — people locked out of their vehicles and homes, people who had their locks picked (and trust violated), and even those with a finicky door lock that just wouldn’t budge anymore. If your situation concerns a locking mechanism — be it residential or commercial — our team has “been there and done that.” Our decades of industry experience translate to a speedy, reliable, and smooth experience that takes the frustration out of working with a Naples locksmith. No one should have to live with the feeling of compromised security. Whether you manage a warehouse, proudly own a home, or are an everyday driver, you deserve to know that the locks around you are doing their proper job. The sinking feeling in your gut knowing that your home or business was broken into is, from our perspective, one of the worst feelings that anyone could suffer. Compromised locks lead to a natural state of distrust and uncertainty. Damaged, rusty, or malfunctioning locks result in wasted time and sheer frustration. Misplaced or inaccessible keys due to human error present unexpected and inconvenient situations. In any case, no matter what your unique situation is, it’s a priceless feeling of reassurance knowing that an emergency locksmith in Naples is ready to bail you out at any time. Home is where the heart is. It’s a place that you’ve paid good money (or pay good money on a monthly basis) to relax, rejuvenate, and enjoy life knowing that you’ll be warm, dry, safe, and secure separate from the outside world. You create memories in your place of living, achieve major life milestones in your residence, and continue growing into the best person you can be. But there’s one important thing that makes your place of living wholly yours, entirely excluded from the community: your locks. Whether you and your family are sound asleep, gone on vacation, or just hanging out in the living room, anyone could approach your home at any time. It’s with these security concerns in mind that it’s absolutely imperative to ensure that your home’s locks are strong, secure, and up-to-date. Your Naples locksmith from Sure-Lock will happily assess your home’s security features including front door locks, sliding glass door locks, keypad-based locks, and other locks that could be compromised. We’re more than happy to upgrade your existing residential locks if we determine that they’re not up to our security standards. Even though you don’t live at your place of work (although we’re sure that sometimes, it feels that way! ), your business is a place that you spend a lot of time around. Your inventory or your specialized equipment is worth many thousands if not millions of dollars depending on your operation, and it pays to know that these items are as secure as possible. Sure-Lock Locksmith makes it our goal to give you (and the appropriate personnel) total control over your business’ security. Need a reinforced deadbolt for your small retail business? Done. How about a keypad lock with a code that only a few employees know? We’re on the case. Have multiple buildings that need to be routinely accessed? A master key system may be the best solution for your business, and we’re more than happy to install it for you. At the end of the day, as a manager or the owner of a business, there’s enough to worry about as it is. Why let security concerns invade your thoughts and steal precious time and sleep from you? Focus on what really matters to help your company thrive, and our skilled team of Naples locksmiths will focus on what we do best for businesses: commercial locksmithing. When the layman considers “What would I need a professional locksmith for?”, the need for assistance with their locks generally comes down to getting locked out of somewhere. After realizing that you’ve foolishly locked your keys inside of your vehicle, you’re immediately grateful for the fact that your smartphone is still on your person. With a sense of urgency, you quickly search “locksmith near me” in hopes that someone will come out to your location and get you back inside of your vehicle. That’s a very common emergency locksmith scenario, along with locking yourself outside of your home or even your office. Our team of Naples emergency locksmiths knows that accidents happen and things tend to slip through our minds, and that’s why we’re more than happy to help you regain rightful access to your vehicle, residence, workplace, or wherever else that you’re attempting to access. We’ll even come to you during holidays, late hours into the night, or the weekends. No matter when you require our locksmithing services, count on Sure-Lock to be there. When we promptly arrive to bail you out, we’ll work carefully yet swiftly to get you back on your feet as soon as possible. Rest assured that your Naples locksmith will never damage anything in the process or break your locks — in every emergency locksmith job that we carry out, we do it right. Has Finding The Right Home Security Solutions Been A Mystery? Let Sure-Lock Locksmith Solve The Case! Though unfortunate circumstances often prompt the need for a Naples locksmith (particularly an emergency locksmith), it’s easy to see any locksmith as your saving grace. However, it’s important to note that some locksmiths are more legitimate than others, and those without easily identifiable information should never be trusted. When you contact Sure-Lock Locksmith, our friendly team will be as receptive and responsive as possible to your questions. Want to know more about how we’re insured or bonded? A wary consumer knows to inquire about these important points before hiring a local locksmith, but then again, an emergency situation often leads to a desperate, hasty search for an emergency lock and key service. Our Naples locksmiths believe that transparency should be involved during every step of your experience. Don’t solely rely on our wealth of positive reviews to ensure that we’re legitimate — hold us to our claims and customer testimonials by grilling us with questions. You could have a great experience with another locksmith company here in Collier County: they’re prompt, well-priced, bonded, insured, and complete the job in a swift and thorough manner. 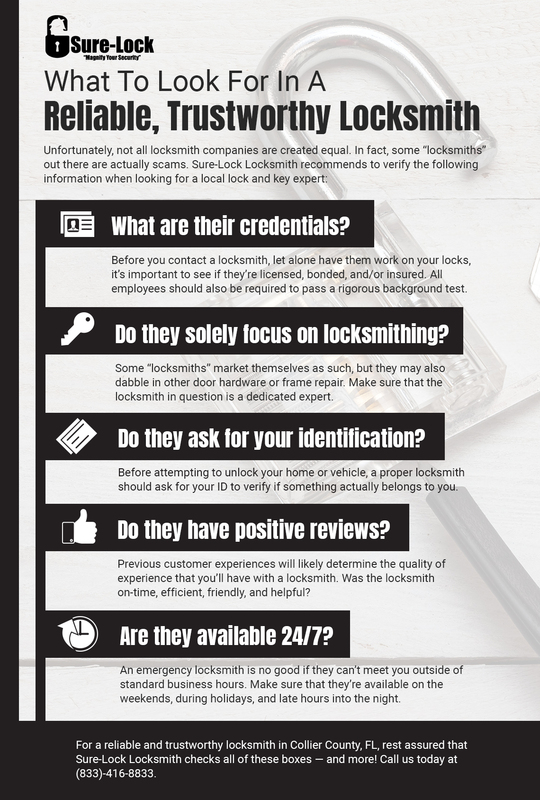 They’ve essentially checked all of the boxes that a locksmith company should check, but after everything is said and done, you notice something rather obvious to your chagrin: the place is a mess. The locksmith that performed the job may have picked up all of their tools and installed your new deadbolt lock correctly and securely, but there’s old hardware laying around your foyer and along with small piles of dust and footprints aplenty. That’s no way to do the job. In our beaming Google reviews, customers routinely note how professional, clean, and respectful Eddie and the Sure-Lock team were when working on-site. Our job is to improve your situation, not add to your headache. In our time as locksmiths in Naples and the surrounding communities of Collier County, we’ve worked with a few types of customers: those who show a mild interest in our processes, those who don’t care at all, and those who want to know every detail of what we’re doing. Sure-Lock wants to assure you that we truly enjoy helping out any of these types of customers, and that we’re not bothered by your questions. It’s your vehicle or home that we’re working on, and we understand that your property and possessions are extremely valuable to you. Folks tend to be reassured about something when they really understand what’s going on. That’s why our locksmiths are more than happy to explain our processes, show you the types of locksmith tools that we’re using, and really make you feel like you’re working right alongside us. Conversely, if you’d prefer for us to work in silence as you go about your own business, we’re completely fine with that! We’re here to help you and your lock situation, not annoy you. To Be Or Not To Be: Replace Or Rekey? This is the age-old question that many people come across, particularly landlords preparing for new tenants or new homeowners. New tenants don’t want the previous tenants to have a key that will unlock the front or side door, and new homeowners (new to them, not brand new) certainly don’t want the previous homeowner to have access to the house. Thus, the time comes to either rekey the lock or outright replace it. In many cases (and though a competing locksmith may suggest that this is necessary for the sake of an easy cash grab), changing every lock on your home is unnecessary whether you’re a new homeowner or a landlord who’s preparing for new tenants. So long as your locks in question are verifiably secure, sturdy, and functional, changing the lock itself is usually the best option. In any case, we recommend asking your Naples locksmith here at Sure-Lock whether rekeying or replacing your lock is truly the better way to go. These statistics aren’t meant to scare you into unnecessarily beefing up your home’s locks, but it does emphasize the importance of properly securing your home. A well-lit space around your home, along with lights turned on inside of your home, will draw unwanted attention to potential intruders. It will also alert them that people may be home, and that’s more than enough to deter burglars who religiously avoid contact with other people. If you’re concerned about your fancy grill or lawn mower getting stolen, then bring it inside or store it in your garage. A padlocked shed is also a much better place to keep your outdoor valuables as opposed to letting them sit in your wide open backyard. Even if you and your next door neighbor get into a passive-aggressive holiday decorating contest every year, make sure to maintain good relations with them. That way, whenever you’re out of town, they can keep a passive eye on your home, collect your mail/newspaper, turn on different lights around your home, and so forth. Sliding glass doors are generally pretty weak in terms of their standard locks. At the very least, if you can’t upgrade to a deadbolt lock or custom lock for your sliding glass door, reinforce it with a strong piece of wood or metal bar and wedge it in between the door and the wall. In A World Of Uncertainty, Your Naples Locksmith Is Here To Help! It’s impossible to predict when or if you’re going to lock yourself out. You never know when your home’s trusty front door lock may start to act up, and you never know who may possess an old key to your new home. In any case, the safest thing that you can do in life is to cover your bases and contact our team of friendly and professional locksmiths in Naples. Sure-Lock Locksmith is ready to help you find the right lock and key solutions for your home or business, or bail you out in a time-sensitive, emergency scenario. Get started with Collier County’s Top Rated Local® locksmith today! Learn More About The Areas We Serve Here!